ASU now has a building on the campus of Hainan University, a top-tier college in the south of China, and will offer three dual degrees in the new initiative, called the Hainan University–Arizona State University Joint International Tourism College. It’s the first time ASU will offer undergraduate degrees to students entirely in another country, according to Kathleen Andereck, director of the School of Community Resources and Development, who is leading the program. The Chinese government, which is fully funding the venture, chose ASU as a partner in the new college because it wants to develop a tourism workforce in Hainan, an island province at the southernmost tip of China, she said. Hainan University has about 30,000 students and has programs in agriculture, business and hospitality. “Hainan is like the Hawaii of China — it’s a beautiful, subtropical island that has a lot of resort development,” said Andereck, who also is a professor and the director of curricular initiatives in the College of Public Service and Community Solutions. Jonathan Koppel, dean of ASU's College of Public Service and Community Solutions, addresses the freshmen on the first day of the semester at Hainan University–Arizona State University Joint International Tourism College in Haikou, Hainan, China. This week, 253 freshmen started their academic year in the new college with a welcome ceremony and their first course — the one-credit ASU 101, a weeklong intensive being taught by Andereck and Rebecca Barry, a senior lecturer the School of Community Resources and Development. The college hopes to enroll about 300 a students a year in the dual-degree program, in which ASU degrees are paired with Hainan degrees. Students will graduate with a bachelor’s from each university, with some credits transferring between the institutions, Andereck said, noting that Chinese students typically take a higher course load than American students. Two of the degrees are in ASU’s School of Community Resources and Development: tourism development and management, which is matched with Hainan’s hotel-management degree, and parks and recreation management, which is paired with Hainan’s geography and urban and rural planning degree. The third degree program is with ASU’s School of Public Affairs — public service and public policy, matched with Hainan’s public administration degree. The 253 freshmen in the new joint tourism college will spend this semester working on their English proficiency. Andereck said the freshmen are taking general-education courses this year and focusing on English proficiency. They’re admitted as non-degree-seeking students until they pass English 107 in the spring — the English class for non-native speakers. 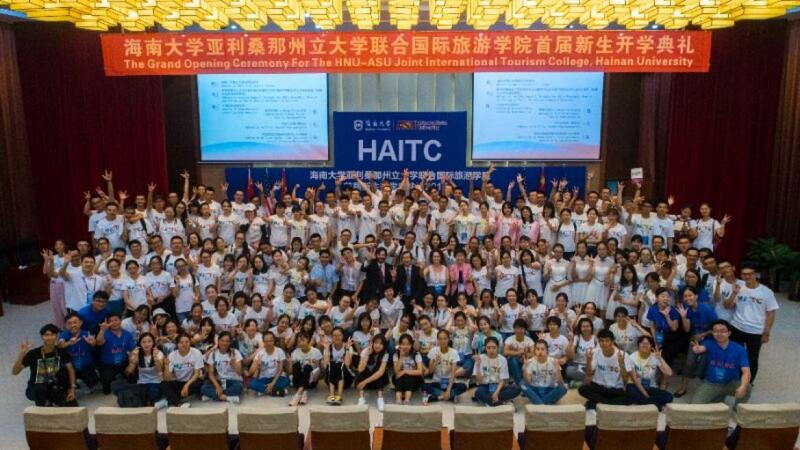 About one-third of the faculty for the tourism college will be from ASU, which will hire professors to live and teach in Haikou, where Hainan University is located. In addition, current tourism faculty from ASU will have the option of teaching a half-semester or semester there. Hainan University renovated a building to house ASU, which includes computer labs, modular classrooms and touch-screen smartboards. In a few years, university will build a new site for the tourism college on another Hainan campus nearby. “They even planted a cactus garden to be more ‘Arizona,’ ” Andereck said. The partnership gives ASU a physical presence in China, where the university already has many partnerships. “This will be good for ASU’s reputation in China,” she said. Top photo: Students in the new Hainan University–Arizona State University Joint International Tourism College gathered on the first day of the semester earlier this week.